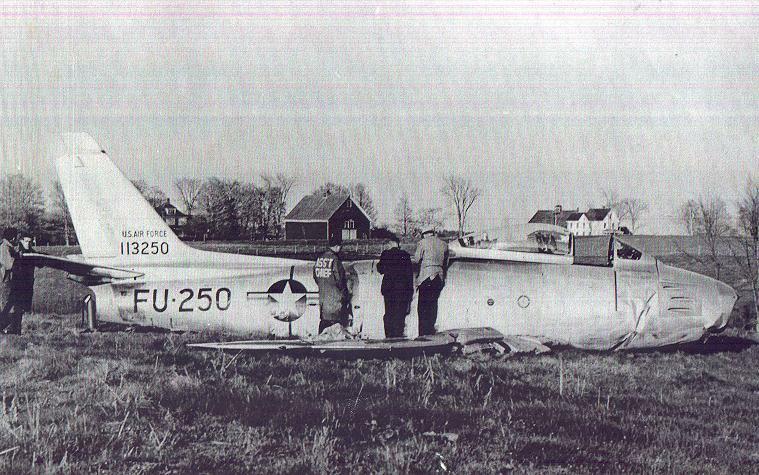 1Lt Bruce Campbell walked away from this forced landing near Dow AFB in Bangor on May 6, 1953. After a 90 minute training flight, two 49th Fighter Interceptor Squadron F-86Fs made a landing approach. Campbell's engine flamed out on base leg, with gear and flaps down. He ditched in a field near the base. 8/2/02- Links page, Chamberlain F-89C added to "Visit" sites. with the katahdingateway site. Added "humor" page to "About Aviation Archaeology"
8/7/02-Added the Charleston F-84B site and completed the "About" section. 8/8/02- Modified home page. Added the Macwahoc F-101B. 9/29/02- Added the Dedham F-101B, updated homepage. added photos to home page and Mysteries page. added the article Phantom Crashes about "crash scares"
12/17/02- Added the Greenville B-52C. details of the incident, added a link to an article in the"About" Aviation Archaeology page. Amherst P-84B crash sites. Cleaned up and corrected links. Spruce Mountain Mystery Wreck. Update Current Crash Site Searches page. 8/1/07- Added the Chapman F-89D crash site pages and updated the "Mysteries" page. 1/27/08- Added the Maine Military Aircraft Accident List and the Project Closure pages. 2/15/08- Changed Maine Military Aircraft Accident List to a Word document. and edited sone article pages to be more readable. 4/26/08- Additional updates to Maine Military Aircraft Accident List. 3/1/09- Updated crash list with over 80 new pieces of information. 7/3/09- Another major update to the crash list. 4/3/12- Added Caswell KC-135, Garfield FB-111A, Stockholm F-86E, and Franklin F-89J site pages. Added "Solved Mysteries" page along with several stories. Updated crash list.